In the Christmas story, angels proclaim, "Peace on earth, goodwill toward men." This is a time of year of both holiday bustle and quiet and reflection. And it seems a time to wish, hope, and work for peace. This month's project is a Peace Around the World Book that can function as a book or be hung as an ornament on a tree or a branch. 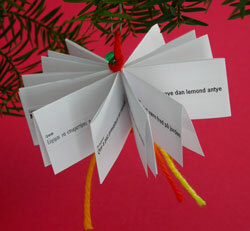 The Peace Around the World Ornament Book joins four Hot Dog Booklets to make a small book which can display "May peace prevail on earth" in 24 languages. The text is available at http://www.worldpeace.org/prayer.html. Small flags for printing can be found at http://www1.ocn.ne.jp/%7einfinite/. * 1 piece 8.5" x 11" copy paper cut into fourths so that each piece is 2.75" x 8.5". You could also use 9" x 12" construction paper. * 1 bead. I like pony beads which are plastic and have a large opening. If you use a narrower cord than yarn, you can use a bead with a smaller hole. 1. Make four Hot Dog Booklets. 2. Put glue on the top of one folded booklet and place another one on top. Repeat until all four are glued together but do not put glue on the top. 3. Fold one piece of yarn in half and thread folded end through the bead. Leaving a loop for hanging, tie a knot with the bead inside the knot. 4. Place the bead on top of the book and separate the two ends of yarn. Place one on along the outside spine of the book and the other inside along the center of the book. 5. Tie a double knot at the bottom of the book. 6. To make a small tassel on the bottom of the book: Cut the other piece of yarn in half. Thread the two pieces under the knot, make the ends even, and tie them together with a double knot. The Peace Pole Project website has information about the creation and "planting" of peace poles as well as Peace Pal activities for children. This will be our 28th year of attending the Christmas Revels, a winter solstice celebration, in Cambridge, MA. One of the highlights is always a group rounds singing of Dona Nobis Pacem (Give us peace). "No peace lies in the future which is not hidden in this present little instant. Take peace!" I've used portions of this letter in Christmas cards several times and shared it in book format as well. It was read at the Revels in the past by the late Robert J. Lurtsema.